The renovated De Medici Restaurant re-opened in July 2015 is situated in the beautiful, quiet residential area of Benamara, Estepona. De Medici's new business approach offers customers a top-quality, healthy meal with fresh, natural ingredients to promote a positive lifestyle. What stands out most from their menu is the blend of international tastes and multicoloured ingredients sourced daily from their fresh vegetable garden. They aim to encourage customers to not only enjoy a range of exquisite tastes, but also benefit from their balanced, nutritious meals. 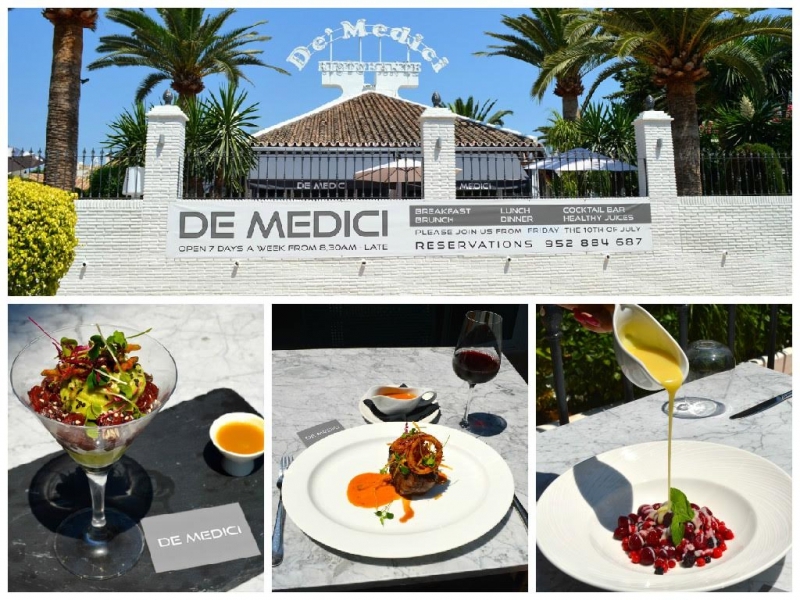 Here you will find i-Marbella's detailed food review of De Medici dishes! At De Medici, the guests can also enjoy live events and entertainment! Behind De Medici's menu will be the constant monitoring of Carole Sobell, who, after twenty years of continuous activity, has gained a highly-respected status in the world of catering, her "beloved profession", and has a strong presence in the English media with an excellent reputation for her work and clientele. She has had the challenge, "and pleasure" of working for many large companies and celebrities such as: the British royal family, US President Bill Clinton, singers Michael Jackson and Lionel Ritchie, a number of world- class politicians and companies from the top of the London Stock Exchange (according to The Financial Times). Meet the owners of De Medici here!